Patients in the Norton Sound region will soon have the option to stay in Nome for their MRI needs. Yesterday marked the grand opening of Norton Sound Health Corporation’s (NSHC) new magnetic resonance imaging machine, or MRI. 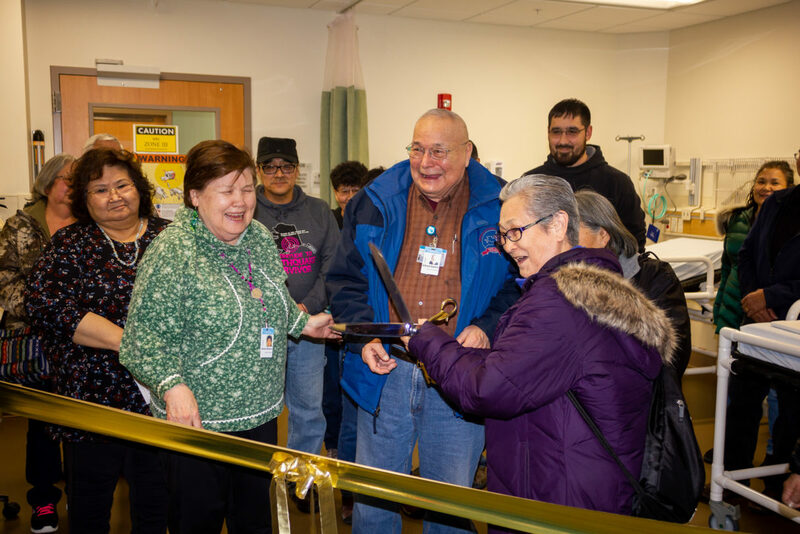 The NSHC Board of Directors and CEO Angie Gorn helped cut the ribbon of the newly constructed MRI addition at the Nome hospital yesterday, signifying a dream come true, according to Preston Rookok. According to NSHC, every year, about 350 patients travel outside of the region for MRI services. With an MRI machine housed at the Nome hospital, fewer patients will have to wait on a list to be seen by one of the Anchorage hospitals, like Alaska Native Medical Center, for their MRI needs. Rookok mentioned that if there had been an MRI machine in Nome around 2007, some of the residents of St. Lawrence Island who died from cancer that year could’ve been seen sooner, and their cancer might have been detected in time to save them. Board member Berda Wilson referred to NSHC’s new MRI machine as life-saving. Although the MRI addition has been officially unveiled, Cathy De’Angelis, the manager of Radiology, says due to staffing issues the MRI machine is not expected to be used on its first patient until mid-March. Image at top: The ribbon-cutting at Nome’s Norton Sound Regional Hospital on Wed., Jan. 30, 2019. At front center are, left to right: NSHC directors Berda Willson, Alfred Sahlin, and, holding the scissors, Alice Fitka. Photo: Davis Hovey, KNOM.